Public art in the Luxembourg Gardens: A model of a Rolls Royce made with lattice work. 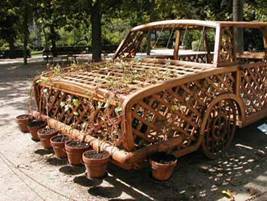 The rear bumper of the Rolls sports potted vines. Now that’s what I call a “green” car. 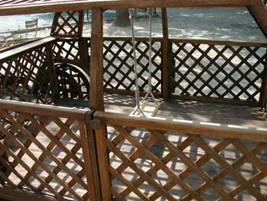 Inside the Rolls, instead of a seat, we find a wooden swing. Our friend Jerry, from Berkeley, came over for a drink yesterday evening and then the three of us walked to dinner at Le Tire Bouchon – the last night that this fine resto is open for this season. Proprietors Isabelle and Laurent Houry begin their three-week vacation today. We wished them a “bon vacances,” but I’m sad that they are gone. We won’t see them again until next July. Sob. They change the menu every 6 weeks at Le Tire Bouchon, assuring that fresh, in-season ingredients are used, and keeping the quality of food very high. 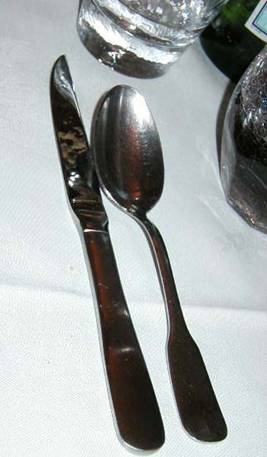 While on the subject of dining, I must ask you, have you ever noticed how different spoons are in France than in America? In France, if you are given a spoon at all, it will most likely be a large one, like the one at left -- except for the very small spoons the French give you for use in your coffee or tea. The teaspoon of the size that is normally used in America is rarely, if ever, seen on a French table. I wonder how that came to be so? Dessert that has a sauce like crème anglaise (with accompanying fork). Otherwise, unless you are given the small spoon for coffee or tea, you are given no spoon at all. And in the brasseries where the flatware is already rolled up in a paper napkin and sealed with a paper ring, you will find inside that roll only a knife and fork. You will be given a spoon only if it is deemed necessary. In the photo at left, you see a large spoon only because I had just ordered gaspacho. While the French like their spoons large or small, but not medium, they are in a state of disagreement about cars. There is an environmental movement underway to ban SUVs from the middle of French cities. Lexus, bless their hearts, has made a hybrid 4x4 available in France, at a price that starts at 56,000 euros ($70,000)! Patrick Coroller, the man in charge of “transport questions” in the “Agence de l’environment et de la maitrise de l’energie (ADEME)” says, “Le 4x4 is no more just a vehicle of the fields [“champs,” in French”], is becoming a vehicle of the Champs Elysées. ADEME alleges that in the city, 4x4s consume 48% more fuel than the more typical cars consume. Fewer than 10% of 4x4 owners actually use the all-terrain features of their vehicles. At any rate, the 4x4s and most other Parisians’ cars have left the city for vacation or at least a long holiday weekend. (Monday is the Feast of the Assumption, a holiday in France even though France isn’t very Catholic anymore.) Today, all those cars are outside Paris, on the highways headed for vacation hot spots, creating traffic jams of the very worst kind. But it is quite peaceful here in the middle of Paris.